Ethical wills, or "legacy letters", go back to Biblical times. They spring from the enduring human desire to help the following generations by leaving something more than mere possessions behind. Also called "spiritual wills", some people choose to write an ethical will and leave it in a deed packet along with their testamentary will. Some people choose to share it while they are still living - others may decide to wait until they are gone. Other people, with the stamina for it, write a book - or even two (as Elizabeth Edwards did in preparation for her own tragic death in December 2010 and as Paul Kananithi did with "When Breath Becomes Air" in 2016). The advantage of an ethical will or legacy letter on video is that it captures the real person - their personality, their smile - themselves. They can be as simple or as detailed as you wish. Just below is a short sample of an ethical will on video. Ethical wills, personal legacy statements and spiritual letters on video allow us to pass our ethical values and life lessons on to the next generation. Preparing an ethical or spiritual will is not always easy. It requires us to confront the big issues of human existence - including our own limited time on this earth and that our children and our grandchildren will one day be left without our caring and our help. Legacy letters also require some care and tact - words left behind cannot further be explained or taken back! Call us on 949 742-2755 about creating a spiritual will or legacy letter on video. 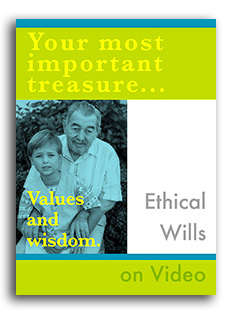 Interested in preserving your family values and personal principles with an ethical will or legacy letter on video? Show who you are as a person. Spiritual wills allow you to pass along the fruits of your experience and your wisdom. Call us here at Your Story Here Video Biography to talk about an ethical will or legacy letter that fits your needs.